This article is about the Game Boy Advance remake of Super Mario Bros. 2. 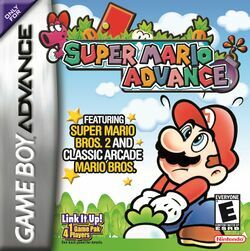 For the Super Mario Advance series as a whole, see Super Mario Advance (series). For the Choose-Your-Own-Adventure book based on this game, see Super Mario Advance (book). "SMA" redirects here. For information about Super Mario Adventures, the Nintendo Power comic, see Super Mario Adventures. Super Mario Advance (Japanese: スーパーマリオアドバンス Sūpā Mario Adobansu) is the port remake of Super Mario Bros. 2 developed by Nintendo Research & Development 2 as a launch title for the handheld Game Boy Advance, released in Japan in March 2001 and in North America and Europe in June of the same year. It is based on the Super Mario All-Stars remaster for the SNES, and also contains a remake of the original Mario Bros. game. Advance includes many new features, gameplay mechanic changes, graphical and audio enhancements, and stylistic and aesthetic alterations from the All-Stars edition, with the most significant changes being the addition of the enemy Robirdo, a robotic Birdo, replacing Mouser as the boss of World 3; the addition of the "Yoshi Challenge", in which players may revisit stages to search for Yoshi Eggs; a new point-scoring system; multiple hit combos; enlarged sprites; and digital voice acting. The game was re-released on the Wii U's Virtual Console in Japan on July 16, 2014, in North America on November 6 of the same year, and in Europe and Australia in March 2016. The developers reduced the display resolution to fit better on the GBA screen, and brightened most of the original color palettes to combat the handheld's lack of a backlight. In the process, Subspace lost its Super Mario All-Stars dark blue tint, and is now only slightly darker than Subcon. Many sprites are stretched, shrunk, and rotated, due to the GBA's technical prowess. Pidgit's carpets appear stretched, and as such, larger. Bombs now pulsate when they're about to explode; explosions also do so. Enemies now rotate when thrown. Birdo's eggs now rotate upon hitting a wall. Cherries and hearts rotate and shrink when collected; the former poofs away, while the latter re-sizes and floats to the Health Meter afterwards. Also, hearts are bigger, and now pulsate as they float upwards. Trouters enlarge as they reach the peak of their jumps and shrink while falling back down. The "1UP" sprite is redesigned, and it now gets bigger before exploding into particles. Phantos use a larger sprite, which appears shrunk down to the original sprite's size in most cases; they appear in full size when they exit the screen upon the player's throwing the key or losing a life. The original Phanto graphic is used for the lifeless ones. The playable characters' sprites are also edited. Luigi's overalls (which were purple in All-Stars) and Toad's vest (which was blue) swapped colors. Toad's cap spots were edited to match his kind's official appearance. Front- and back-view "door entry" sprites, backflipping sprites for the Power Squat Jump, and skidding sprites were added for the player characters. Their throwing sprites (which were only used in midair in the All-Stars version) are used again when standing on ground. The Super Mario Bros. 2 title/story screen is removed. On the Bonus Chance, Warp, and Game Over screens (which reuse the old title screen's design), the character and item sprites on the bottom are now gold, like the border, and the black background now fades to blue on the bottom. The character select screen is changed to a three-dimensional circular screen similar to that used for the Tag Barrels in Donkey Kong 64. The slots on the Bonus Chance screen are now shaded to look more 3D. If the player does not get any coins before clearing a level, "No Bonus" appears on the Bonus Chance screen alongside everything else without flashing. Pidgits and their carpets, Hoopsters, and Autobombs were recolored purple, red, yellow, and gray, respectively; and there are no red Beezos, only yellow. The original forms of the bosses Fryguy and Clawgrip (respectively, a simple pair of eyes and a normal Sidestepper) are seen before the heroes battle them; four giant bubbles transform them before their fights. A "flash" effect appears when the player touches a Spark. Characters, items, and enemies fall in front of the water in World 4, as in the NES version. Jar interiors have new colorful backgrounds, with a black background outside the jar walls and floor. In levels, a full HUD is shown on the top of the screen (as in most other 2D Mario games), displaying the player's current world and level, lives (with character symbols similar to those in Super Mario Bros. 3), Ace Coins, Yoshi Eggs (in Yoshi Challenge mode only), and score, alongside the Health Meter. The sky in the background of the corked jar room now scrolls, and the row of stained glass near the top of the room is now centered. The "Contributor" screen only shows the lower half of the original screen, alongside shorter windows. On the cast list screen, the black border is absent, and the view is widened (due to the GBA's resolution). In the cast list, Robirdo is added between Clawgrip and Tryclyde, and like Birdo's sprite, it too lacks its bow. Due to removal of the Super Mario Bros. 2 title/story screen, the in-game story (which was seen by waiting on the title screen) is removed. The character select screen now displays "Choose a Player" instead of "Please Select Player." Princess Toadstool is now simply referred to as "Peach" (her original Japanese name and the current universal standard, as introduced in Yoshi's Safari and retained by Super Mario 64 onwards) as opposed to just simply "Princess". Toad regains his original Japanese name in that country's version. On the Pause and Game Over screens, the "&" symbols in "Save & Quit" and "Save & Continue" became "and". The former screen now headed with "Pause". The player's score is displayed on the level intro screen and both it and the current level are displayed on the Game Over screen. On the latter screen, the options from the All-Stars version don't appear until or is pressed. The stats of each character are shown on the character select screen. "COURSE CLEAR!" is now displayed upon clearing a level. Misspellings and the Ostro/Birdo mix-up are corrected in the international version of the cast list. Robirdo is added between Clawgrip and Tryclyde. On the Contributor screen, the character used the most times is declared the "MVP" rather than the "Contributor," and the number of times each character was used does not appear until after Wart passes across the screen. Mario, Luigi, Toad, and Peach now start the game and each life in their Small forms with only one hit point of the current maximum remaining, and their Small forms persist between levels (as in the other 2D Super Mario titles), whereas in the original and All-Stars remaster, they always start each life and level in their Super forms with full health regardless of whether they were in their Small or Super forms upon completion of the previous level. An extra Mushroom was added to each level, raising the maximum hit points per level to five. A "Try Again" feature was added to the Pause Screen that allows the player to restart levels from the beginning in Small form. The boss order is slightly altered: a new enemy named Robirdo, a robotic Birdo, acts as the new boss of World 3; and the second Mouser battle is moved to World 6, where it replaces Tryclyde's second battle. While climbing vines or ladders, can be used to drop off at any point. can be used as an additional run button. and can be used to pan the camera vertically and horizontally, respectively, though the latter button can only be used in vertical sections. Toad only runs faster if he's holding a normal-sized POW Block or Mushroom Block. In horizontal sections, the camera is usually panned ahead of the playable character, rather than centered. After the game is beaten, a "Yoshi Challenge" mode is added; the player may revisit the levels to search for two Yoshi Eggs per stage, hidden in Subspace where they replace two of the Mushrooms, and is allowed to select any level to play regardless of whether or not they played them before beating the final boss. An all-new scoring system is introduced, similar to that used in the BS Super Mario USA Power Challenge; players get more points for making one thrown object hit lots of enemies, and are awarded an extra life if they hit enough foes. This game features "giant" variants of vegetables, enemies, and POW Blocks, with enlarged sprites and larger areas of reach. The giant POW Blocks bounce around and shake enemies off the screen four times as opposed to just once. Red Shells are enlarged as well, and are now capable of bouncing off walls and hurting the player. Hearts (here resized) appear much more frequently than in the original; they appear when two or more objects are involved in a collision, when giant enemies are thrown to the ground or beaten, when Red Shells defeat enemies, when Ostros are beaten, simply floating in midair (mainly in boss rooms), and as special radishes that can be pulled up from the ground. Two new objects are introduced: the Roulette, which gives the player either a heart, a bomb, or a Starman after being thrown; and the "Spark Chaser", located inside jars, which clears Sparks on the walls, ground, and ceiling. Five red Ace Coins are added to each level, which reward an extra life if all are collected in a single level playthrough. The level intro screen is now preceded by a level chart (like that of Super Mario Bros. Deluxe's Challenge Mode) which shows what levels the player has cleared and how many total Ace Coins they have as a percentage (the Pause screen also has this total); when all five Ace Coins have been collected in a level, a star is added to the corresponding panel. Large carrots are added to Worlds 1-1 and 1-3, which spring from under hills to catapult the player to higher places. The ribbons of red and green Birdos are removable. Bombs are bouncier, taking longer to stop moving than in the original or All-Stars versions. Players can now bet more than one coin per spin in the Bonus Chance game to earn more extra lives (the coin amount used times the normal amount of lives gained). Lining up three "7" symbols now gives five extra lives, rather than ten. Generally, enemies do not respawn unless the player leaves and reenters the area. Cobrat and Snifit bullets travel slower. Pansers shoot fireballs less frequently. Running Ninjis don't turn around as quickly. Swooping Beezos charge forward above magic carpet-riding player characters. Phantos are now beaten by invincibility alone, without the need of a Stop Watch. The entire soundtrack has its quality downgraded for the GBA's sound chip. Due to the removal of the Super Mario Bros. 2 title/story screen, the title screen music is also absent. Digital voice acting is added for the four playable characters (who are given voice samples for such situations as being chosen, picking up items like Mushrooms or Crystal Balls, gaining an extra life, clearing a level, and losing a life) and the bosses, who are given lines of dialogue for when they begin their respective battles and when they are defeated. An announcer also shouts "Choose a player!" at the character select screen. Some sounds from the All-Stars version, like the "enemy pickup" sound and Autobombs' "flame shot" sound, are removed or replaced. Mouser's "bomb throw" sound, Tryclyde and Fryguy's "fireball spit" sound, and Clawgrip's "rock throw" sound are all changed to Birdo's "egg spit" sound. The "enemy hit" sound is replaced by its Super Mario World counterpart, and like in that game, it increases in pitch during a point chain until extra lives are earned, at which point the aforementioned sound returns (though only for lives gained by invincibility or shells). The drumroll that starts when two of the same picture are lined up in the Bonus Chance minigame now loops until the third slot stops. Whenever the player enters a boss room, a new foreboding track plays, switching to the boss theme once the battle begins. The final levels of Worlds 2 through 5 use the boss theme for the rooms immediately preceding the bosses' arenas (as in the NES version). World 4-2 now plays the ground theme in its first room (as in the NES version), even though the underground background wasn't changed. A chime is added to announce Starmen. Jar interiors have new music, instead of the underground theme. Phantos now make the same noises as the larger Phanto in the background of the key rooms as they move around. The Mask Gate in World 7-2 also makes this sound as it turns around. Nearly all levels have extra items and enemies added to them, and some (like World 1-1) also undergo minor design alterations. The placement of certain 1-Up Mushrooms is changed, and there are also 1-Up Mushrooms sitting on the surface; these ones are usually contained within bubbles, which the player can pop with three hits. Other items and enemies have also been relocated or replaced throughout the game. New jars were added to levels; some incorporate Ferris wheel platforms with Shyguys riding them, and one in World 5-2 has a blue spike that expands and contracts. Some of these are jars that were previously inaccessible in prior versions, namely those in World 6-1. The game features a Mario Bros. remake that carries over into the other Advance games and the RPG Mario & Luigi: Superstar Saga. The remake features a "Classic Mode" based on the original game's co-op mode, and a "Battle Mode" similar to that used in the All-Stars remake of Super Mario Bros. 3. Changes to the original game come in the form of enhanced graphics, the addition of music where it was originally absent, an extra POW Block in every stage, the addition of the Power Squat Jump, and the replacement of Shellcreepers with Spinies. Super Mario Advance was developed due to the success of Super Mario Bros. Deluxe for the Game Boy Color in 1999. Despite the use of most graphical and audio assets from the All-Stars remaster, the game was coded from scratch; new sprites and audio cues were created because their existing counterparts were "not good enough". The development team purposefully decided to add "large" versions of enemies and increase the number of enemies on-screen as a means of highlighting the Game Boy Advance's processing power. The Mario Bros. remake was initially a separate project designed to experiment with the Game Boy Advance's link cable feature, but it was eventually decided to include it as an extra. The main staff for this game includes directors Satoru Iwata and Toshiaki Suzuki, producer Masayuki Uemura, and assistant director Hiroaki Sakagami. Super Mario Advance received generally positive reviews, garnering an aggregate score of 84% on Metacritic. When GameSpot reviewed the game, it thought that Super Mario Bros. 3 or Super Mario World would have been a better choice for a launch game considering their respective popularity; both titles were eventually also remade as part of the Super Mario Advance series. Conversely, IGN praised the choice, calling it "one of the most polished and creative platformers of the era". sound familiar? It should. This remake of the NES classic Super Mario Brothers 2 doesn't break any new ground, but it's still a good title to pick up for the GBA." Game Boy Advance Shahed Ahmed, GameSpot 8.2/10 "Those interested in single-player platformer gameplay, albeit with relatively loose controls, will find Super Mario Bros. 2 both unique and highly challenging, while those looking to link up their GBAs and taking part in multiplayer action will crave the lively, fast-paced gameplay in Mario Bros. The fact that Nintendo decided against packing the GBA game with added features, as in Super Mario DX for the GBC, is disappointing, but Super Mario Advance deserves a close look among the crowded crop of software for the handheld, if for its multiplayer mode alone." Game Boy Advance Marc Nix, IGN 8.2/10 "If you do pick up Super Mario Advance, I can pretty much promise you won't regret it for a second. It's probably the most immediately satisfying game on the Game Boy Advance right now... until, of course, the next Mario adventure." For references also present in the original game, see here. Mario Bros.: Clawgrip is revealed to be a Sidestepper. A remake of this game is included. WarioWare: D.I.Y. Showcase: One of 18-Volt's microgames is directly based on Super Mario Advance. The game's graphics data contains smaller versions of the slot machine icons and two unused Vegetables, which also went unused in Super Mario All-Stars. A mouse, possibly intended for Mouser's boss intro with a blue Cobrat, possibly intended for Tryclyde's boss intro were also found in the game's data. Also, an early screenshot of the game, shown on a GBA on the cover of Nintendo Power Issue #143, shows one of the two "hills at night" backgrounds brightened like all the others; in the final game, these retain their original color palette. When playing World 2-2, World 3-1, or World 6-3 as Luigi, the player can pick up a Spark Chaser out of its jar, hitting a Spark at the top and trying to get to one side or the other in the process; once the player leaves the jar, the Spark Chaser becomes a Yoshi Egg, with no change in behavior. In World 2-3, if the player does a Power Squat Jump to the ceiling in the digging area with the Key in hand, their character can get stuck in the wall. In Fryguy's boss fight area, if the player slides underneath one of the Flying Mushroom Blocks and releases the down button the character's body will be stuck inside the block; the player can get out of it by sliding again. In World 5-1, if the player jumps on the rightmost log, jumps on top of the wall to the right, picks up the first mushroom block and throws it right before landing, the block will float in mid-air. In World 6-1, if the player navigates the Pokey off of the ledge, it will float in mid air, with no change in behavior. The player can navigate the Pokey back onto the ledge. The title screen for the Mario Bros. remake, featuring Mario and Luigi with the enemies they encounter in-game. ↑ “2004年6月，神游推出小神游GBA，捆绑简体中文版《超级马力欧2》和《瓦力欧寻宝记》” (In June 2004, iQue released the iQue Game Boy Advance, with the Simplified Chinese versions of Super Mario Advance and Wario Land 4 bundled.) 大狗 (June 22, 2016). 《记录》第17期：神游中国（上）. 触乐. Retrieved February 28, 2017. ↑ Nintendo Download: 10th March (Europe). Nintendo Life. Retrieved March 7, 2016. ↑ The extent to which color palettes were brightened is inconsistent and varies widely throughout the game. Some palettes, such as those used for the tilesets in the ending cutscenes, were not brightened at all. ↑ Super Mario Advance (gba) reviews. Metacritic.com. June 11, 2001. Retrieved July 20, 2009. ↑ Super Mario Advance for the Game Boy Advance review. GameSpot. Retrieved 2010-02-26. ↑ Super Mario Bros. 2: Super Mario Advance - Game Boy Advance Review. IGN. Retrieved 2010-02-26. This page was last edited on April 5, 2019, at 22:33.